This time it's the Liebster Award!!! I. Post the award on your blog. II. 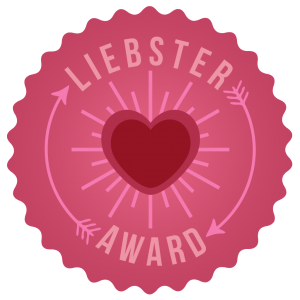 Thank the person who nominated you, linking back to the Liebster post on their blog. III. Write 11 random facts about yourself. IV. Nominate another 11 bloggers whom you think deserved of this award. V. Answer the 11 questions asked by your nominator, and write 11 questions for your nominees to answer. 1. Some of my favourite animals are, dogs, wolves, horses, meerkats, gibbons, (pet)mice and cheetahs. 2. I believe in more than 3 types of love. 3. When I'm excited I often subconsciously tap my hands rapidly on my sides. 4. I have a crooked smile. 5. If I'm watching, listening or reading something I love or am very interested in, I probably won't hear you the first time you call. 6. Ever since I was little I have loved setting up scenes with toys and figures. 7. I love to draw Manga and watch Anime. 8. I sometimes go outside alone and sing at the top of my lungs. 9. The girl who nominated me with this award I have known for at least 13 years. 10. I am running out of interesting facts. 11. I love strategy games, but I'm no good a strategising. Right, now for the questions Lecheria Criada gave me. 1. Have you ever been overseas, if so, where? 2. What was the last sweet delicacy you cooked? Um, date loaf I think. Err, I have no idea! I love too many! 5. If you had the chance, would you go back in time and relive an event of your choice? If so, which? Probably the horse riding gymkhana I was in around 2 or 3 years ago. 6. Does the smell of Christmas beetles mean anything/bring back any memories for you? Erm, the sight of one does, but the smell? I don't believe I've ever really smelt one. Again, I love war too many! 8. Who is one person you want to meet before you die? Um, good question. I don't really know but I guess maybe, the Queen? 9. Who was the last person you spoke to? 10. If red was a number, what would it be? 11. What is one thing you are looking forward to at this moment? There, done! Ok now for the nominations. I don't know many people who haven't had this, so I'll just do a few I don't think have received it. Sararose from This is Me speaking . . .
1. What is an acute angle? 2. When you were young, did you dislike broccoli? 3. When doing math, do you use a calculator? 4. Of the past week, what has been your favourite memory? 5. Board games, card games, or video games? 6. If you could have just one super power, what would it be? 7. If you found $1,000 what would you do with it? 9. What does the colour pink remind you of? 10. Do you enjoy fires in winter? Or water in summer? How old r u Rosie? If you don't want to, you don't have to tell.